Metal matrix composites (MMCs) possess significantly improved properties including highspecific strength; specific modulus, damping capacity and good wear resistance compared tounreinforced alloys. There has been an increasing interest in composites containing low densityand low cost reinforcements. Among various discontinuous dispersoids used, fly ash is one ofthe most inexpensive and low density reinforcement available in large quantities as solid wasteby-product during combustion of coal in thermal power plants. Hence, composites with fly ashas reinforcement are likely to over come the cost barrier for wide spread applications inautomotive and small engine applications. 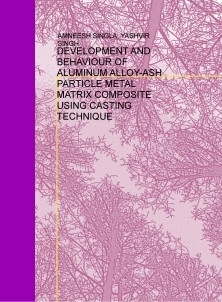 It is therefore expected that the incorporation of flyash particles in aluminium alloy will promote yet another use of this low-cost waste by-productand, at the same time, has the potential for conserving energy intensive aluminium andthereby, reducing the cost of aluminium products. Now a days the particulate reinforcedaluminium matrix composite are gaining importance because of their low cost with advantageslike isotropic properties and the possibility of secondary processing facilitating fabrication ofsecondary components. The present investigation has been focused on the utilization ofabundantly available industrial waste fly-ash in useful manner by dispersing it into aluminium toproduce composites by stir casting method.